The U.N.'s International Organization for Migration reports 10 bodies have washed up on Libyan shores after a boat reportedly capsized. At least 90 migrants are believed to have drowned after a boat capsized off the coast of Libya on Friday. 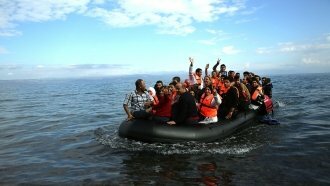 The U.N. International Organization for Migration reports 10 bodies have washed up on Libyan shores. Two survivors swam to shore, and another was reportedly rescued by a fishing boat. IOM says this shipwreck brings the total number of deaths on the Mediterranean through the first month of 2018 to 246. Last year, it was 254 for the same period. Over 6,000 migrants and refugees have crossed the sea into Europe through Jan. 28, according to IOM. An official notes people who die on the Mediterranean are often "victims of chance."